The beginning of a new year is always a time of reflection, contemplation and hope for what is to come as well as a chance to see the past year in a different light. 2013 was a busy and productive year in which my work took me to a lot of interesting places. 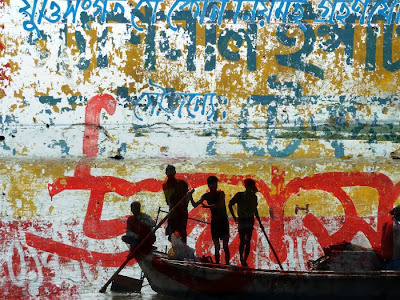 The year started with Where Water Meets Land, an exhibition at The Memphis Brooks Museum of Art, of fourteen large-scale photographs and two large collages based on my experience in Bangladesh in 2010. I gave a gallery talk and a hands-on workshop at the museum. We also produced a brochure for the exhibit. It was very meaningful for me to share the imagery from such a beautiful country and talk about my experiences there, especially since Bangladesh is ground zero for important global trade and environmental issues. I showed the same photographs and collages at Cumberland Gallery in Nashville, where I have been represented for over twenty years. The owner, Carol Stein, an early supporter of my work, organized an evening lecture in the gallery in which she asked me questions about the work and the experience in Bangladesh. I thought it was a very stimulating conversation and the large audience seemed very interested and moved by both the work and words. Later in the summer I showed the Bangladesh body of photographs at Bennett Gallery in Knoxville, where I have also been exhibiting for over twenty years. They held a Saturday afternoon talk in the gallery there, which was very enjoyable. It was inspiring to connect with interested people about the work and to visit with old friends. People seem to really respond to this work. I don’t consider myself a photographer, but this body of work in photography possesses some of the same sensibilities of light, surface, and image as do the paintings. At Bennett Galleries, I showed nine new paintings with the photographs. The photographs and paintings remain for sale at Bennett Galleries, Knoxville. In the Spring I juried an exhibition of regional high school art for an exhibit at the Gallery at St. Andrews Sewanee High School. I also gave a lecture on my current work and attended the opening for the exhibit. I cannot fully express how meaningful it was to interact with the students and be supportive of their art endeavors. I have been involved with this school for many years. They have a really committed studio art faculty, great facilities, and an emphasis on the arts. I am a deep believer in the importance of arts education for all grade levels. This is another conversation. I returned to Sewanee in June to teach a one-week printmaking workshop at Shakerag Workshops, which had its ten-year anniversary last year. Shakerag was started by several art faculty members at St. Andrews to provide two weeks of craft workshops with leading artists and craftspeople. This was my third time teaching there. I just love being there with inspiring people in such a beautiful setting, focused on what we all love. Studios are open twenty fours hours and it is an all out, high–energy mix of work, food, play, lectures and connecting with other artists. I was invited to give a short talk on my work at the Frist Center for the Arts in Nashville along with two other artists as we all had work on exhibit in the Martin Artquest Gallery. This is an excellent hands-on experiential gallery for people of all ages. I spoke about my experiences with art education as an artist and a teacher. They hung my large woodcut, La Frontera (2010), a large 33-color woodcut printed in Patzcuaro, Mexico, and also two of the blocks used for printing. People are allowed to do rubbings from the blocks. The Frist has been a monumental addition to the cultural world in our region, originating and hanging many important exhibitions. I stop in every time I go to Nashville and there is always something worth stopping in for. The highlight of 2013 for me was my exhibition, Las FrutasDel Mundo, (Fruits of the World) at the Centro Cultural Antiguo Colegio Jesuita in Patzcuaro, Michoacan, Mexico. This exhibit consisted of two strains of work made in Mexico since 2009. 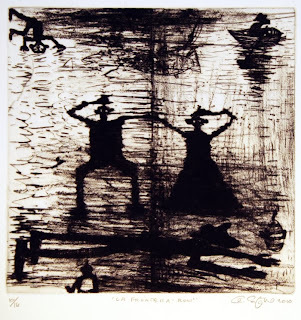 I have been working in the printmaking workshop at the Colegio since 2009 and have produced drypoint etchings, woodcuts, and collagraph prints, in collaboration with the printers there. Some of the imagery in the prints references the Mexico-U.S. border (la frontera), with movement indicating crossing. This imagery became the basis for another ongoing project with local weavers. Beginning in 2011 with a chance visit to a local store, looking for rugs, I asked about the possibility of using some of my own imagery for a rug. Thus began a collaboration between myself, a family of weavers, and the talented and knowledgeable Ruth Mitchell de Aguilar who procures and dyes the wool. A father, Victoriano Servin, and his son, Ricardo, and nephew, Juan, have been weaving spectacular tapestries based on my images. They are all enormously talented. 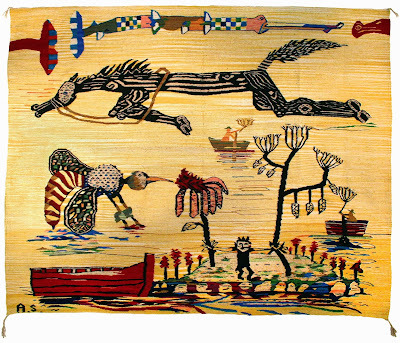 So, back to the exhibition, which consisted of eleven of the tapestries hung on the walls, eight small, framed tapestry designs, eight prints, four large watercolors, two panel paintings and a collage on panel. Some of the tapestries are quite large so it was an impressive exhibit in a grand space in an old stone building with tile floors and large windows along one wall. There is an evident evolution in the imagery from the earlier prints to the tapestries so that all of the other works are visible in the tapestries. People loved the work and really praised the weavers for their impressive skills. I’d like for them to receive even more recognition. We have all formed friendships through this project, which will continue and will nurture our cross-border, cross-cultural endeavor. We produced a brochure for this exhibit as well and also a documentary film by Nemesis Films: Eduardo Bautista, filmmaker. 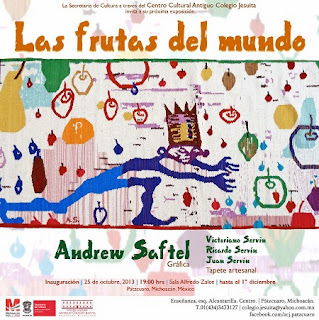 You can see the complete film Las Frutas del Mundo on You Tube. I think he did a great job to tell the story of the tapestries and capture the feeling and emotion of the collaboration. I am very proud of this project, exhibition, collaborations in printmaking and tapestries and see a lot of possibilities for future work together in Mexico. As I go through the year, sometimes it seems like things are stalled and nothing is happening with the work and I’m disconnected from the world out there. But as I look back on all of the exhibits, talks, workshops, travel and connections with people, it adds up to a deep and rich life. Always a tough question but one can speculate, reach and hope for things. I try to put ideas in motion, like a train, and then see where they go. I just keep working everyday and know that it will add up to more than I can imagine a year from now. I am enjoying where the imagery has been going and hope to continue to use the ideas and characters in the newer work. I think there is a good balance between the humor and references to more serious issues in the falling fruit imagery and the idea of horizontal movement across borders. Right now I am working on some sizeable watercolors/ drawings, searching for more images for new tapestries and paintings. 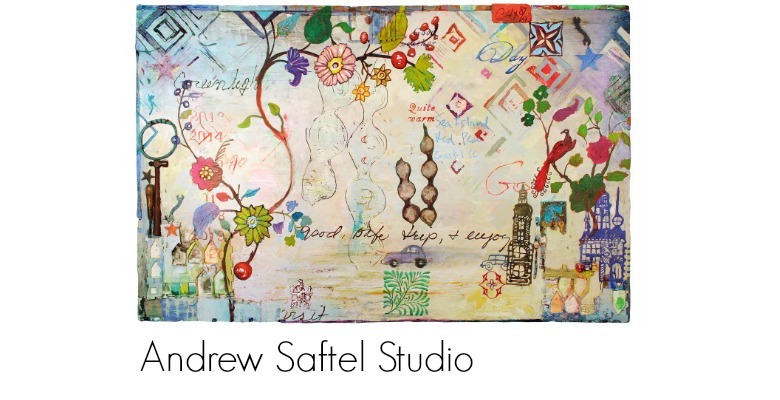 I am eagerly looking forward to several upcoming projects, workshops, travel and exhibits in 2014 in addition to the studio work. First off, Cumberland Gallery in Nashville will be taking some of my work to the LA Art Fair- January 16-18. Carol Stein does several of these fairs each year, which is great exposure for my work. Her booths always look great since she has a selective, eclectic, quality eye for art. 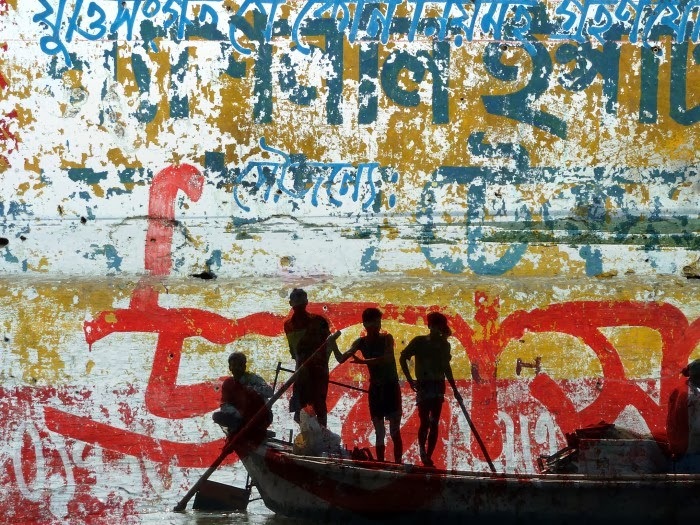 In June I will be returning to Bangladesh to lead printmaking workshops under the direction of the Bengal Foundation. As we did on the 2010 trip to Bangladesh, my friend and poet Whitney Baker and I will travel together, he leading poetry workshops. I am a little nervous but really excited about the trip. We have a lot of friends and fellow artists there that we will be glad to reconnect with. There is an election there right now so hopefully the outcome will lead to a better situation. The details are just being outlined but I’m sure it will be a very deep experience in many ways. I will be teaching a two-week printmaking workshop, at Haystack Mountain School of Crafts in Deer Isle, Maine from August 10-22. This will be my third time teaching at Haystack and I really look forward to it. I will teach multi-block collagraph and relief printmaking. The campus is in a fantasy setting on the rocks of the Maine coast. The director, Stuart Kestenbaum, has a special way of setting a great tone at this really special school. We will see what else the year brings but I eagerly await whatever comes in the studio and out in the world of people moving through time together. As always, thank you for stopping by my blog and please feel free to share it with anyone you think might enjoy. You can also follow along on social media (Twitter & Facebook) to keep up with the latest happenings.